The most widely used calendar in Gaea Parallaxis is the Common Calendar that originated in northern Borea [Boriya] and has spread to world wide usage in much the same way as the Common Tongue. The Common Calendar has twelve regular months per year and runs from midwinter to midwinter in the northern hemisphere and midsummer to midsummer in the southern. A calendar year is generally 365 days long, comprised of five months of 31 days each and 7 months of 30 days each. The actual length of an astronomical solar year is approximately 365.2422 days (that's 365 days, 5 hours, 48 minutes and 46 seconds). Due to this discrepancy and to keep the calendar year in sync with the solar year it is necessary to add an extra day every four years - except when it falls in a century year (ending 00) which is not divisible by 400. These 366 day years are called leap years and the extra day is added at the end of the year, giving the twelfth month 31 days instead of the usual 30. In the ancient calendar system from which the Common Calendar is derived this extra day was termed a thirteenth month and is still to this day sometimes referred to as such. Any given date is expressed as the day, followed by the month, followed by the year; for example 24/03/1059. If necessary the era can be noted after the year, for example 1059CE (of the Common Era) or 1059BCE (Before the Common Era). 01. Snowmonth [Snoamunth]: this first month of the year and of the winter quarter is 30 days in length and is approximately equivalent to the period we know as Capricorn (22 Dec - 20 Jan) in the zodiacal calendar. 02. Solsmonth [Solsmunth]: this second month of the year and of the winter quarter is 30 days in length and is approximately equivalent to the period we know as Aquarius (21 Jan - 19 Feb) in the zodiacal calendar. 03. Lentenmonth [Lentenmunth]: this third month of the year and of the winter quarter is 30 days in length and is approximately equivalent to the period we know as Pisces (20 Feb - 20 Mar) in the zodiacal calendar. 04. Eostarmonth [Iyostarmunth]: this fourth month of the year and first of the spring quarter is 31 days in length and is approximately equivalent to the period we know as Aries (21 Mar - 20 Apr) in the zodiacal calendar. 05. Merrymonth [Meriymunth]: this fifth month of the year and second of the spring quarter is 31 days in length and is approximately equivalent to the period we know as Taurus (21 Apr - 21 May) in the zodiacal calendar. 06. Fallowmonth [Faloamunth]: this sixth month of the years and third of the spring quarter is 31 days in length and is approximately equivalent to the period we know as Gemini (22 May - 21 Jun) in the zodiacal calendar. 07. Haymonth [Hiamunth]: this seventh month of the year and first of the summer quarter is 31 days in length and is approximately equivalent to the period we know as Cancer (22 Jun - 22 Jul) in the zodiacal calendar. 08. Cornmonth [Kornmunth]: this eighth month of the year and second of the summer quarter is 31 days in length and is approximately equivalent to the period we know as Leo (23 Jul - 23 Aug) in the zodiacal calendar. 09. Sheddingmonth [Shedingmunth]: this ninth month of the year and third of the summer quarter is 30 days in length and is approximately equivalent to the period we know as Virgo (24 Aug - 22 Sep) in the zodiacal calendar. 10. Huntingmonth [Huntingmunth]: this tenth month of the year and first of the autumn quarter is 30 days in length and is approximately equivalent to the period we know as Libra (23 Sep - 23 Oct) in the zodiacal calendar. 11. Fogmonth [Fogmunth]: this eleventh month of the year and second of the autumn quarter is 30 days in length and is approximately equivalent to the period we know as Scorpio (24 Oct - 22 Nov) in the zodiacal calendar. 12. Wolfmonth [Wulfmunth]: this twelfth month of the year and third of the autumn quarter is 30 days in length and is approximately equivalent to the period we know as Sagittarius (23 Nov - 21 Dec) in the zodiacal calendar. 13. Yulemonth [Yewlmunth]: this ancient thirteenth month of the year and fourth of the autumn quarter is 1 day in length and only appears in leap years. In modern times this day is more often incorporated into a leap year's Wolfmonth as the 31st day. This extra day is considered a part of the Yuletide festival and as such is treated as an extension of the Yuleseve celebrations. The yearly solar cycle is most obviously witnessed with the passing of the four quarter seasons; spring, summer, autumn and winter. In antiquity the four quarters were often grouped into the winter half (autumn and winter) and the summer half (spring and summer). The seasons were so central to life and society that their passing has taken on great symbolic and religious meaning, so much so that even today the great pagan festivals of antiquity are still celebrated as festive periods and a time for feasting, though much of their original religious significance is lost and largely redundant. These once holy days, running from the evening of one day to the evening of the next, have been extended into three days of rest and recuperation for the majority of the working population when only the most necessary jobs of work are carried out. In a society that does not have weekends in the sense that we would recognize, these festivals have retained their importance and significance much more so than in our society where really only the winter festival is still "celebrated" to anything like a universal extent. 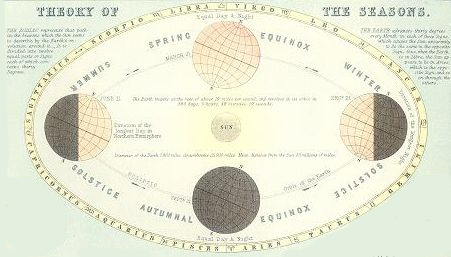 The festivals have developed round the solar seasons of the Northern hemisphere where they were first observed. With the expansion of the Free Commonwealth around the world and into the Southern hemisphere, these festivals and their observance have spread with them even though the natural seasons of the local areas involved are no-longer directly comparable. 1. Yuletide [Yewltaiyd]: the festival of birth and renewal that marks the midwinter solstice as the end of the old solar year and the beginning of the new. Yuleseve [Yewlsiyv]: 30th of Wolfmonth (21 Dec), marks the last day of the old year and the beginning of the longest night, also known as Mother's Night. Traditionally Yule celebrations commenced at dusk or in the evening of this day (hence Yule's 'eve'). Homes are decorated with numerous candles and traditional ever-greens like holly, ivy and mistletoe. Evergreen trees are often decked out with colourful ribbons and brought into the warmth and sanctuary of the home. Yule [Yewl]: 1st of Snowmonth (22 Dec), midwinter's day and the first day of the new year. Feast day celebrating the victory of the new born Sun over winter for, although it is the day with the shortest period of daylight, henceforth the hours of light begin to grow longer each day. Traditionally the key part of the day is the feast itself, the most important and expansive of the year, when all manner of food and drink is taken in profusion as a symbolic strengthener for the winter sun. Yulesgift Day [Yewlsgift Dia]: 2nd of Snowmonth (23 Dec). Traditionally this was a day for giving alms and aid to those less well off, to help them through the worst of winter, but has also become a day to give gifts to family, friends and loved ones. Also known as Gifting Day, or Boxing Day due to the tradition of calling the gifts given on this day Yule boxes. 2. Springtide [Springtaiyd]: the festival of purity and potential that marks the end of the winter quarter (and the ancient winter half) and the beginning of spring. Springseve [Springsiyv], 15th of Solsmonth (4 Feb), the last night of winter, though traditionally the coldest night of the solar year it marks a point when the hours of daylight start to noticeably lengthen. Candles are lit to help the strengthening sun on this Night of the Waxing Light. In pagan symbolism the Hag of winter is transformed into the virgin maid who represents the budding potential of spring – an aspect of the goddess Sol. Springsday [Springsdia], 16th of Solsmonth (5 Feb), the first day of spring, a feast day in celebration of nurturing and childhood that has its roots in the seasonal nature of agriculture, it represents the first stirring of the buried seed within the earth and the beginning of the traditional lambing season. Ewesmilk Day [Yeuwsmilk Dia], 17th of Solsmonth (6 Feb), an ancient pagan purification festival now almost completely lost except for the traditional libation, a quantity of ewes milk, drank by women who wish to become pregnant in the coming year, or scattered on the fields to promote the fertility of the crops and livestock. 3. Eostara [Iyostara]: the festival of fertility and conception that marks the spring equinox. Eostaraseve [Iyostarasiyv], 30th of Lentenmonth (21 Mar), a transition point of the year when the light and dark of the day are of equal measure. Fires are lit to encourage the growing light to triumph over the darkness. Traditionally the sun child to be born at the next Yule is conceived tonight so it is considered an auspicious time for prospective parents to couple. Eostarasday [Iyostaradia], 1st of Eostarmonth (22 Mar). Eostar is an aspect of Mani, the virgin lunar goddess, represented as a hare she symbolizes the inevitable loss of virginity and innocence with the coming of adulthood. Her feast day is seen as a time for giving – often anonymous – tokens and sentiments of love, fidelity and desire. Also a social occasion for dances and parties where single young men and women can come together, meet and socialize, random couples often being formed by a series of lotteries throughout the night. Summer Finding [Summer Fiynding], 2nd of Eostarmonth (23 Mar), also known as Eggsday [Egsdia], the egg being a symbol of the sun as giver of life, sustenance and fecundity. Looking forward to summer, this day is traditionally marked by various fairs and occasions for fun as well as by hunts or races and other pursuits involving eggs. The eggs, usually hard-boiled and brightly painted in the past, are now more likely to be of the brightly wrapped chocolate or confectionery variety. 4. Maytide [Miataiyd]: the festival of joy that marks the end of the spring quarter and the beginning of summer. Mayseve [Miasiyv], 15th of Merrymonth (6 May), the last day of spring, this evening and night is seen as the major fire festival of the year, bonfires are lit, torches brandished and candles and lamps distributed to encourage a good and fertile summer ahead. Jumping through the flames and smoke of the central bonfire is considered a bringer of good luck and fortune. In pagan times couples were encouraged to spend the entire night out in the fields, orchards and groves, frolicking and laying together to promote a good harvest. Maysday [Miasdia], 16th of Merrymonth (7 May), the first day of summer and the feast day of May (Mia), the Flower Bride – an aspect, or daughter, of the mother goddess Frigg, patroness of the fields, of crops and grain. Today is a day of masked processions, maypole dances and general merrymaking that culminates with the mock wedding feast and the crowning of the Flower Bride and her consort, the Green Man of the wild-wood, as the queen and king of Summer. It has become a traditional time for betrothals, engagements and weddings. Summer Fairsday [Summer Fearsdia], 17th of Merrymonth (8 May), the first of the year's great fair days, a time of fairs and merrymaking, of races, sporting competitions and entertainments. 5. Litha [Litha]: the festival of life that marks the midsummer solstice. Lithaseve [Lithasiyv], 31st of Fallowmonth (22 Jun), another fire festival, the midsummer celebrations begin with an evening of bonfires, set on the windward side of buildings and fields so the purifying smoke is blown over them. Torchlight processions, with the circular twirling and swinging of burning brands at the end of chains, do a circuit of the same buildings and fields in a sun-wise direction to promote good fortune, the vitality of the sun and to encourage the continual turning of the wheel of life. Lithasday [Lithasdia], 1st of Haymonth (23 Jun), the midsummer feast day when burning wheels or barrels are pushed, rolled or sometimes carried around the fields and villages of the area – often seen as a competition or race between villages and communities. The great feast enjoyed on this day is second only to the Yule feast in terms of importance and indulgence. Midsummer Fairsday [Midsummer Fearsdia], 2nd of Haymonth (24 Jun), another day of merrymaking, fairs, and races, of sporting competitions and entertainments. 6. Loafmass [Loafmas]: the festival of community that marks the end of the summer quarter (and the ancient summer half) and the beginning of autumn and the harvest season. Loafmasseve [Loafmasiyv], 15th of Cornmonth (7 Aug), an evening of burning corn dollies and wicker men – the symbolic vestiges of ancient sacrificial rites that were thought to promote and enable a good and bountiful harvest. Loafmassday [Loafmasdia], 16th of Cornmonth (8 Aug), feast day marking the traditional baking and eating of the first loaf from the new season's corn harvest. This day is seen as a celebration and confirmation of community and social harmony, embodied in the communal breaking and consuming of the traditional staple dietary commodity that is the loaf of bread. Autumn Fairsday [Aotum Fearsdia], 17th of Cornmonth (9 Aug), the third and last of the year's great fair days. 7. Thanksgiving [Thanksgiving]: the festival of thanksgiving that marks the autumn equinox, the high point of the traditional harvest season. Thanksgiving Eve [Thanksgiving Iyv], 30th of Sheddingmonth (22 Sep), this evening is for the getting together, saluting and toasting of family and friends; giving thanks by way of liquid, and usually alcoholic, libations. Thanksgiving Day [Thanksgiving Dia], 1st of Huntingmonth (23 Sep), this feast day is a thanksgiving celebration for all of the sustaining and nourishing gifts and produce that nature, in her bounty, has provided. Winter Finding [Winter Fiynding], 2nd of Huntingmonth (24 Sep), the start of the traditional season for the hunting of all wild game – in modern times it is, more often than not, a day for treasure hunts and games of hide and go-seek. 8. Hallowtide [Haloataiyd]: the festival of remembrance that marks the end of the autumn quarter and the beginning of winter. Hallowseve [Haloasiyv], 15th of Fogmonth (6 Nov), an ancient celebration of the traditional yearly livestock harvest in preparation for the lean winter months ahead and in which bonfire’s and jack-o-lanterns are lit to mark the end of autumn and the harvest season. Often effigies or guises of hated figures both contemporary and historical, are burnt upon the bonfires of this night. Hallowsday [Haloasdia], 16th of Fogmonth (7 Nov), the first day of winter, a solemn feast day when all those who have given their lives for others or in the service of the Free Commonwealth are commemorated and honoured. Day of the Dead [Dia ov dhe Ded], 17th of Fogmonth (8 Nov), when all of the ancestors and those that went before are commemorated. Comment on, discuss and debate the Solar Cycle and the Months of the Year by replying to the Blog Post HERE!